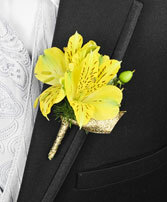 Yellow alstroemeria, green hypericum berries, greens with gold ribbon wrap. Other colors are available. 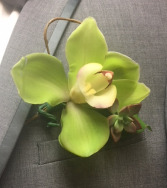 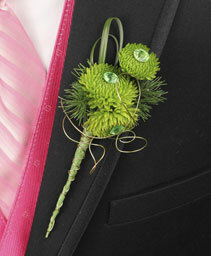 Cym Orchid with succulent accent boutonniere. 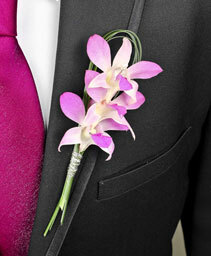 Cym Orchid can be green (as shown above), white with pink/purple center, or solid pink or purple. 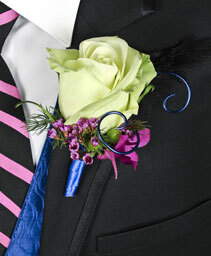 **Shades can vary from stem to stem. 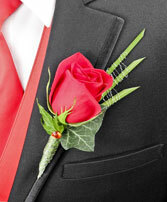 Red rose, ivy leaf, silver bullion, bear grass and red rhinestone. Red rose may be substituted for another color.